My husband Mitch and I live on our 360 acre ranch in southern Oregon. For the past 23 years I have bred, trained, and shown Miniature Donkeys. We usually have a herd of about 100 donkeys here at any given time. I have shipped them all over the United States and have sent about 20 overseas to Belgium, Holland, and England. I am experienced in animal husbandry and genetics and have had success with my donkey program. Mitch is an equine veterinarian and provides me with support in all my animal endeavors. He raises miniature cattle, and we breed Maremma Sheepdogs to keep all the animals safe. ​We purchased our first guardian dogs in 2013 in response to ongoing predation. Two were Great Pyrenees; most were Maremmas, or a cross of the two breeds. They came to us as adults and some were still pups. We raised two litters of cross bred puppies and then made the decision to dedicate our breeding program to registered Maremmas complete with health testing. The early dogs taught me much about the value of a trustworthy temperament. Their guarding styles were all different and I have learned a lot by watching them. This experience has helped a great deal in the selection of our breeding dogs. We spayed or neutered our original unregistered dogs and they now mentor the young registered dogs. This is working out so well!!! We hope to produce our first registered pups in 2017. Our breeding dogs will be PennHIP certified, in addition to having their eyes and elbows examined. ​I am an advocate of health testing for breeding dogs. Understanding genetics can be tricky. Our breeding dogs have been selected for their guarding aptitude as primary, and then for the quality of their conformation. Once they pass these rigorous criteria there is still much I cannot see. I think it makes sense to take full advantage of veterinary examinations such as PennHIP or OFA certifications. The Maremma breed is hearty at this point, with hip dysplasia less common than it is in many other breeds. I think judicious breeding practices will continue to improve this situation. 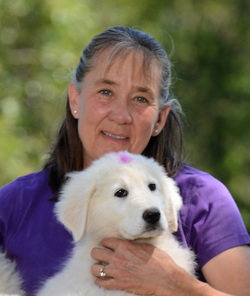 My mission with the Maremma breed is to promote them through education and exposure to the public, and to promote and advocate health testing, through education and by example. If elected to the board I am prepared to offer many, many hours to support these goals in addition to others that are important to the club. You may learn more about me by visiting my web site. That address is: www.BensonRanch.com. Thank you for your consideration.